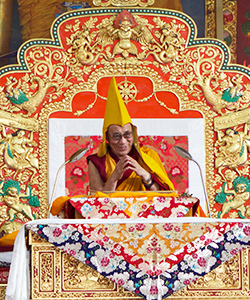 His Holiness the Dalai Lama during the Jangchub Lam-rim teachings at Drepung Monastery in South India, Dec 2012. Rinpoche enjoying lunch at Osel Labrang, Sera, India. Nov 2012. Rinpoche’s health is satisfactory, with continuing progress. Rinpoche was recently entreated by Dagri Rinpoche, Khadro-la Rangjung Neljorma Khadro Namsel Drönme and Nita Ing (new Maitreya Project director) to look after His health properly – and Rinpoche accepted! Rinpoche will have extensive medical check ups in 2013, to ensure that Rinpoche is recovering as fully as possible from the stroke in 2011. We will continue to share any new information via this e-News and our official webpage, Rinpoche’s Health. Subscribe to our RSS feed on Rinpoche’s Schedule page to receive updates automatically as soon as they are available. Rinpoche during the Hayagriva puja sponsored by Rinpoche at Sera Je, India; Nov 2012. “Thanks to those who begin the center, and then all the rest who are studying, practicing and those who come from time to time and those helping the center mentally and physically. What else is there worthwhile doing? That can bring a most happy life! Practicing Dharma – even if it is for oneself – even for one or two sentient beings – it’s so beneficial. Then if one practices Dharma for all sentient beings of the 6 realms – wow wow wow! Unbelievable benefits! Awakening yourself and others, freeing yourself in order to free others. Even reciting mani mantra for numberless sentient beings for their enlightenment – wow wow wow wow wow!!!! Reciting the mani mantra even one time with bodhicitta – wow wow wow wow wow! So meaningful! Reciting mani without bodhicitta, the merit you create is like the sky. So reciting with bodhicitta – wow wow wow wow wow!!! This is the reason you need a center, a place to learn Dharma and practice, where you provide a teacher etc. So you can see the unbelievable kindness of the people who make this happen, like the teacher and the director. You can see the benefits of such a place! A place where you learn the Dharma, where the causes for inner happiness and how to abandon the causes of suffering and eventually to remove all the sufferings are explained. So a place doing this: how important that is, a place providing this. And the people who help in it – wow wow wow! So meaningful. That is the happiest life. Rinpoche with the incarnation of Ribur Rinpoche about to have lunch together and discuss Ribur Rinpoche’s plans. At Osel Labrang, Sera Je, India; Nov 2012. Lama Zopa Rinpoche has been saying that FPMT now has good teachers, education and study opportunities, and what we need now is to have students actualizing the lam-rim, especially attaining shine (calm abiding). When this happens FPMT will be truly successful! FPMT Education Services has taken this directive to heart, and we’re implementing several methods to help students align their practices to Rinpoche’s wishes. Chiefly, we have moved to the top of our list the production of the remaining six manuals for completing the Preliminary Practices so that students may purify and enrich their minds allowing for more rapid progress on the path. We’re happy to announce the publication of the first of these manuals: Preliminary Practice of Dorje Khadro available in hardcopy and eBook. According to Ven. Choden Rinpoche, one of Lama Zopa Rinpoche’s teachers, observation of auspicious days should be according to the date in India, not the date in one’s home country. Therefore, when Lama Zopa Rinpoche is not in India, Rinpoche celebrates Buddha Days and other auspicious dates according to the time in India. To make conversion simple for students, our website now uses India Standard Time as the dates for our Dharma Dates Calendar, so no math or googling is required! 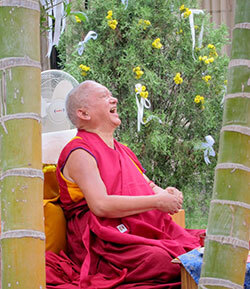 Please rejoice at the amazing array of offerings that the Lama Zopa Rinpoche Bodhichitta Fund has generated recently! 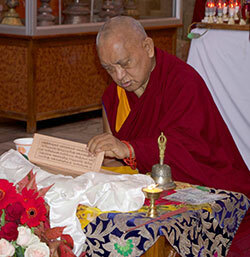 This fund enables Rinpoche’s compassionate service to others to flourish through a variety of charitable donations to Dharma activities, and it provides the resources needed for thousands of daily extensive offerings at Rinpoche’s residences, which are dedicated to the entire FPMT organization and all its centers, projects, services, students and benefactors. According to Lama Zopa Rinpoche, these extensive offerings, and those found at FPMT centers, are part of the reason why the organization has been so successful thus far. An example of recent funds raised and dispersed can be found here. 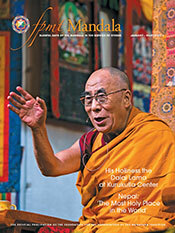 We just published the January-March 2013 issue of Mandala magazine, featuring His Holiness the Dalai Lama’s visit to Kurukulla Center and FPMT’s amazing activities in Nepal. If you aren’t already receiving Mandala, it’s not too late to get a copy. By signing up now to become a Friend of FPMT at the Basic level or higher, we will send you this issue as well as an email with a link to the electronic version, which you can read right away. Also in this issue, an excerpt from Geshe Lhundub Sopa’s new autobiography Like a Waking Dream and Tenzin Ösel Hita shares his thoughts on Universal Education for Compassion and Wisdom; plus news and updates from FPMT centers, projects and services around the world. We invite you to rejoice in the merit created by donating to the Merit Box campaign. Your donations to the Merit Box campaign resulted in the completion of many projects, such as the stupa at Milarepa Center, USA which this summer with a Merit Box grant was able to hire a highly skilled Nepali artist to create and paint the ornate flower adornments to the stupa. Read which centers, projects and services benefited from your donations in 2011. We are delighted to announce that we will provide a Foundation Training in Compassionate Service Oct 22 – 30, 2013 at Jamyang Buddhist Centre, London, UK. All those offering service in the FPMT organization are encouraged to attend. Details about this training and registration information can be found here. Lama Zopa Rinpoche has advised that “the organization would run better if everyone attended training.” We strongly encourage anyone offering service in FPMT to attend. FPMT centers, projects and services can get a 20% discount when purchasing the LIBERATION Tibetan Calendar 2013. This small, elegant wall calendar includes the Tibetan lunar dates and information about more than 30 kinds of practice days and auspicious and inauspicious days for each month. Rinpoche with Tenzin Ösel Hita in California, Sept 2012. Tenzin Ösel Hita recently wrote to the FPMT family. His letter is available to read in full in English, French and Spanish. First of all I would like to say hello to everybody working so hard every day for the benefit of sentient beings through the organization of FPMT. I understand that many of you have extra jobs in order to maintain your family and basic needs in life. Also many of you work as volunteers part time, apart from all the other work you have to cope with. It is very hard, and inspiring. I truly admire every one and each of you for all the effort, dedication and consistency that keeps the organization going. Please join us in welcoming three new study groups (probationary centers), in Colombia, Italy and Spain. There are now 163 FPMT centers, projects, services (and probationary centers, projects and services) in 37 countries! Atisha Centre, Australia is looking for a spiritual program coordinator; Root Institute, India needs a centre manager and a school manager. We welcome Ven Thubten Dondrub as new resident teacher!